THE GOG BLOG by RORY SPEARS, Director of Content. 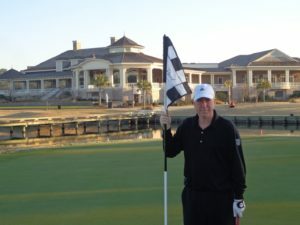 Follow Rory to Pinehurst and on Twitter @GogBlogGuy Linkedin and Facebook. On the Par 3 course the Cradle at Pinehurst. 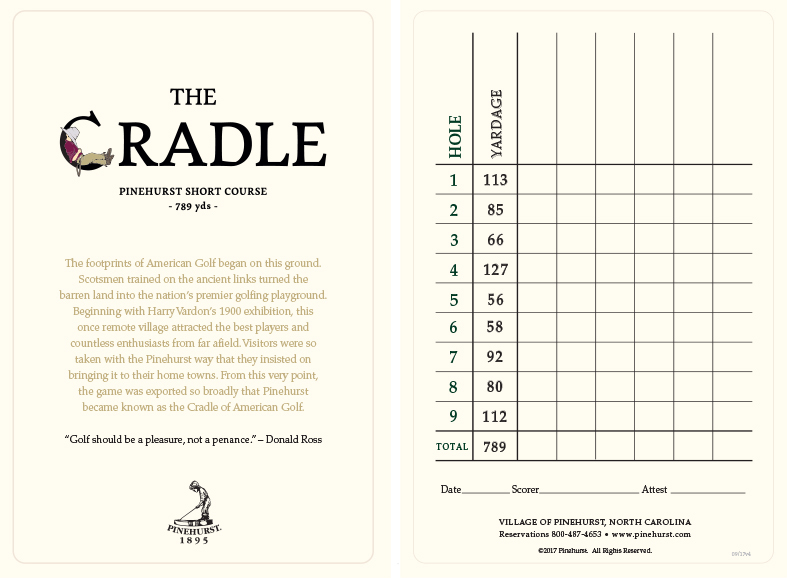 PINEHURST, that is known as the “Home of American Golf”, or the “Cradle of American Golf” has a new Par 3 course called “The Cradle”, and it does rock. 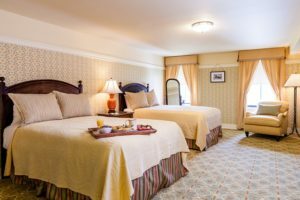 The Cradle is part of a mater plan the Pinehurst Resort is using to keep it’s long storied history and tradition in place, but making modern day improvements to all the facilities so the resort is keeping current with today’s demands from their members and guests. The Cradle that opened last fall has been a big hit, sometimes demand is so strong that groups have gone out in six-some’s. But no worries, pace-of-play is really not effected. Looking for a deal to play Pinehurst Golf, play the Cradle at $50, and you can keep going around all for your $50. It is one of the best deals in all of Pinehurst. A view from the 7th hole on the Cradle. 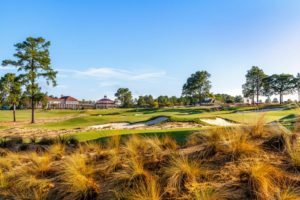 While the Cradle is been making most of the news in Pinehurst, other items of note include, the new Pinehurst Restaurant and Brewery opening this summer, and then this fall the reopening of Pinehurst #4, after the Gil Hanse Renovation. 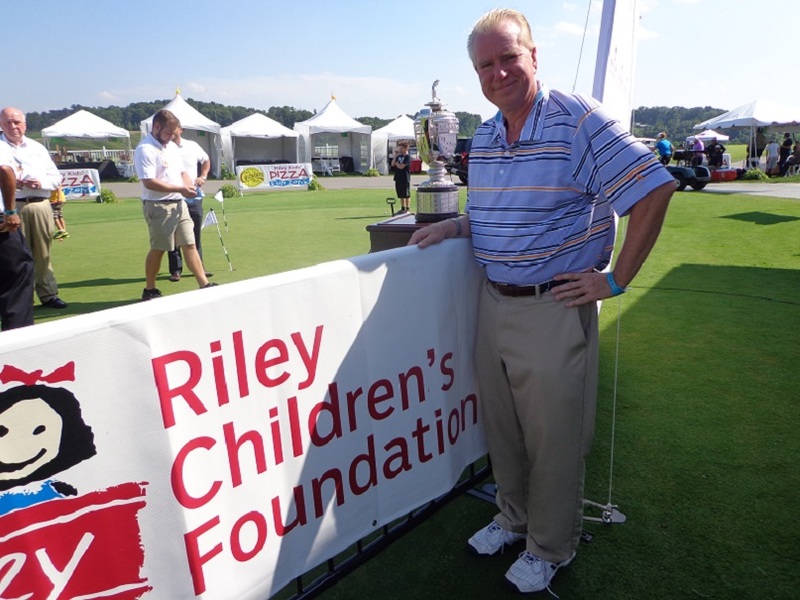 Course #4 should reopen about October 1st, says resort President Tom Pashley. 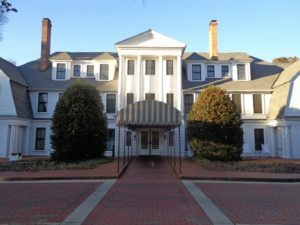 The resort has also purchased the historic home of Donald Ross and took control at the start of 2018. The resort is doing some fix up work to the house and then will use it for special events to TBD. 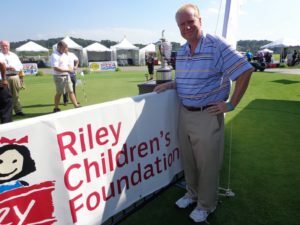 Click here to hear our interview with Pinehurst Resort President Tom Pashley. The resort has had a great sucess with the new restaurant called “Deuces” behind the 18th green of Pinehurst #2, and the resorts new swimming pool. More work on courses #1 and #3 will start after things conclude on Course #4. When the course work is complete, courses 1-4 all designed by Ross will have more of an original feel to them. THE GOG BLOG SPEAKS OUT-TIGER TRAP SPRUNG? THE GOG BLOG by RORY SPEARS, Director of Content. 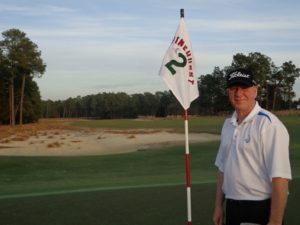 Follow Rory to Innisbrook Resort, and on Twitter @GogBlogGuy or Facebok and Linkedin. 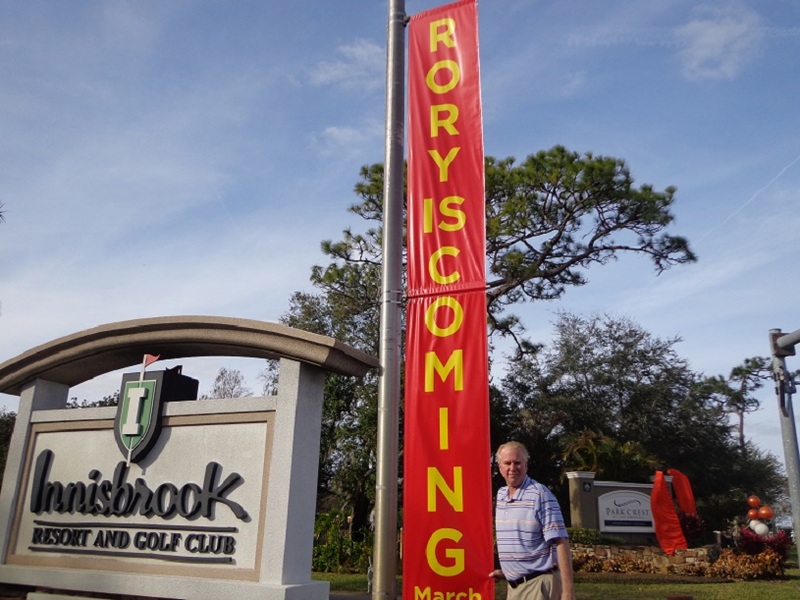 THEY SURE KNOW HOW TO PUT OUT A BIG WELCOME, the Innisbrok Golf Resort in Palm Harbor that is. I had a lot of fun with the resorts retired sales manager Doug Schmidt, and PR star Ramona Herald with the banners and signs that announced my arrival, it was for me right ? who else could it be. It was a fun weekend to be in the Tampa area, golf and the NHL All-Star game all in one. I did the smart thing and stuck around Innisbrook for the golf, and got out early yesterday and beat the heavy rain that dumped over 3 inches starting in the afternoon and running into early evening. It was more rain than the area had received in almost two months. But on Sunday morning it was a great sunny day and the greens on the recently renovated North Course were rolling. About 13 on the stimp according to one marshal who would know. It was almost Oakmont like, there is no problem getting the ball to the hole. I like the North Course and the work that was done and now it appears the South Course will close in June for upgrades, stay tuned. 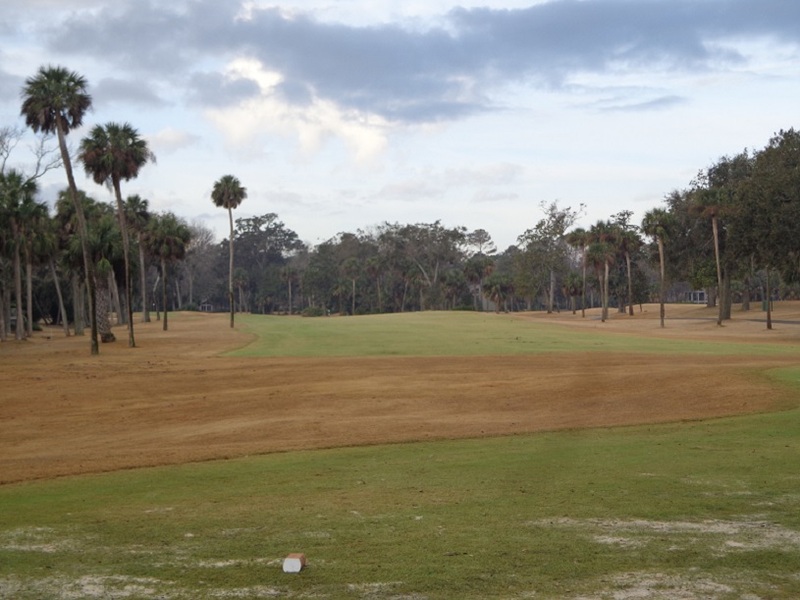 Copperhead is in great shape for the upcoming Valspar Championship in March, the only drawback was the cart path only two months out. The renovation from two years ago has kicked in and resort golfers are enjoying this course as much as the pro’s will in March (5-11). The Snake Pit, holes 16-17-18 are a fun but challenging test to finish your round. 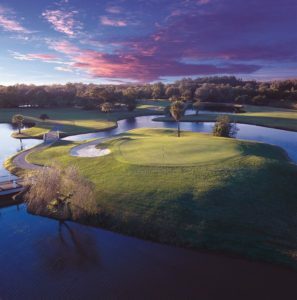 More on Innisbrook in the week ahead. THE TIGER TRAP, has it started up again, or was it a one week frenzy. There were complaints galore about how the Farmers TV broadcast this past weekend turned into all Tiger and occasionally the players who were winning. Golf needs to be very careful about going down this road again, and risk losing viewers and people playing the game. For those of you who think Tiger is #GOAT, Greatest of all time. Please seek help, that is all. Hopefully after one week much of this will be over and golf can return to the great run it’s had in recent years. I get it, Woods is kind of like rock star on his farewell tour and people want that one last look before he goes away for good. Speaking of the Farmers, it is still not over and because the final group took six hours to play 18 holes and the playoff didn’t finish before the sun set. Now with only 12 marshals available, no fans will be let back in to see the finale. By the way, has JB Holmes hit the ball yet, another one of those should bring a “that’s two” from the rules officials. THE PGA MERCHANDISE SHOW was a great way to start the 2018 golf season, and I’ll have plenty in the weeks ahead from what I saw there. 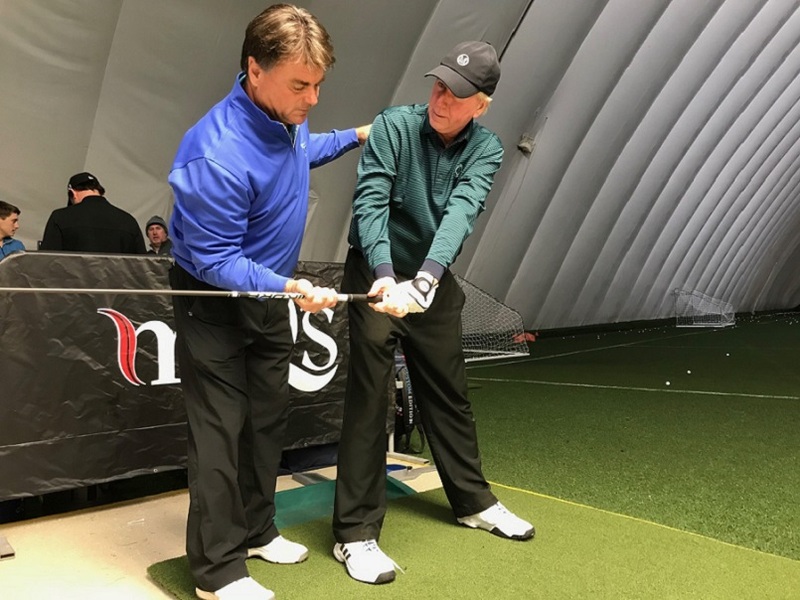 The show’s big winner’s were Callaway, Wilson, Titleist and Taylor Made, all with new product or in Wilson’s case real exposure on the new Driver vs Driver 2 program that will start airing in the fall. Callaway’s Rogue Driver, Woods and Irons drew plenty of attention and I have you hearing from the Callaway experts who created Rogue. WITH THAT it’s off to Naples and a look at Tiberon, a new stop for us. RS. THE GOG BLOG BY RORY SPEARS, Director of Content. Follow Rory to the PGA Merchandise Show, and on Twitter @GogBlogGuy. 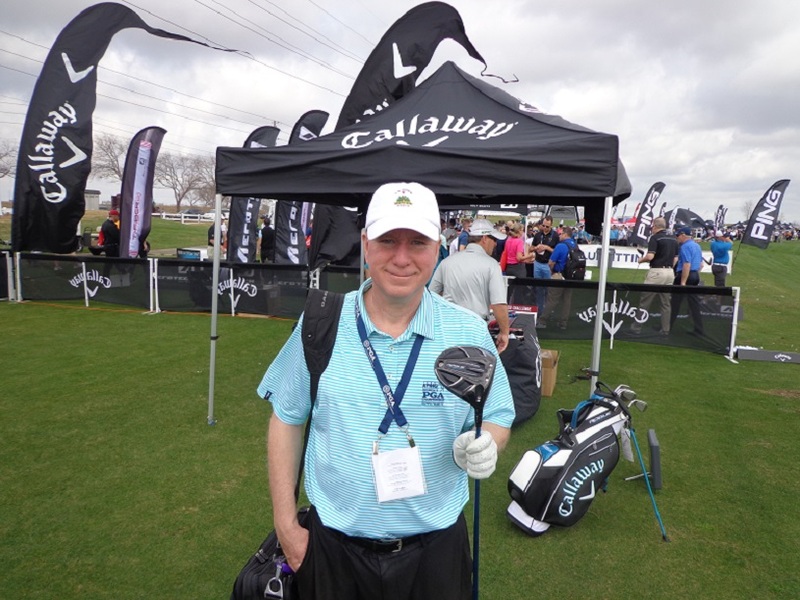 With the new Callaway Rogue Driver. DEMO DAY, it’s like the opening tee shot for the annual PGA Merchandise Show. 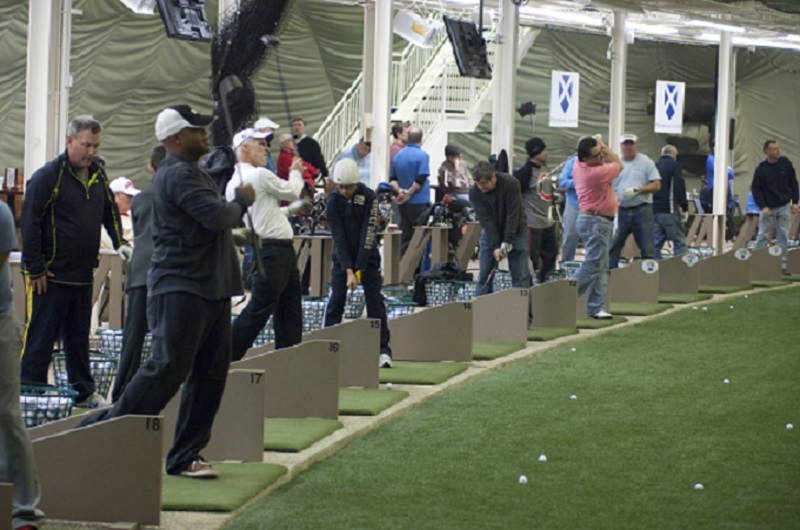 It’s one big circular driving range, that has a lot of golf pro’s and other folks hitting golf balls. It’s one of those days where if you are a range ball pick up guy, like I once was, you just keep driving all day long. I decided to get there early this year, a good idea, but the line to get in was several hundred deep if, you had preregistered. Right out of the blocks the buzz was over at the Wilson area on the range, as the judges got introduced for the Driver vs Driver 2 show, coming this fall after the Ryder Cup on The Golf Channel. Plus the chance to hit the prototypes competing on the show, and then get interviewed with your thoughts on the clubs, and then a chance to be on the show when it starts to air. It will be interesting when the shows run, who made it on the air, and who got left on the cutting room floor. Wilson will have a winner in time to launch it around Black Friday. Former Chicago Blackhawk Jeremy Roenick tells me he will put the winning driver in his bag when it hits the market. IN ADDITION to Wilson, another one of the days big winners was Callaway Golf that had everyone lined up to hit the new Rogue Driver, and other Rogue clubs in the line. I hit the driver and after topping the first one on my first swing of the day, I really smoked the next five shots. This club has “plenty” of potential. Besides the Rogue Callaway has improved it’s Chrome X golf ball and it’s line of Mack Daddy Wedges by Roger Cleveland. No complaints here on either of those products. TITLEIST came though as a winner on demo day in the wedge area, with the new SM 7’s by Bob Vokey. The wedge area was filled most of the day with golfers just hitting flop shots into the target green. There was some buzz over Cleveland Golf, and Ping as well. Taylor Made with it’s new R4 had a line of people waiting to that club as well. 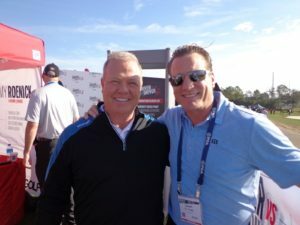 Wilson Golf GM Tim Clarke and former NHL and Chicago Blackhawks star Jeremy Roenick will serve as two of the judges for Driver vs Driver 2 on The Golf Channel this fall. THE GOG BLOG by Director of Content Rory Spears. Follow Rory on Twitter at Gogblogguy, and on Facebook and Linkedin. Demo started off with a bang, and it was Chicago based Wilson Golf that came off the first tee quickly. Making announcements of the new judges for Driver vs Driver 2 to shown this fall after the Ryder Cup on The Golf Channel. While Tim Clarke the GM of Wilson Golf is back as a judge for the second run of DVD 2, former USGA spec guy Frank Thomas and former Chicago Bear LB Brian Urlacher are out. They have been replaced by former Chicago Blackhawk Jeremy Roenick and UK blogger Rick Shiels. Melanie Collins returns in her role as MC and host. The show which is more than halfway taped, had more filming done today at demo day, the first day of the PGA show in Orlando. 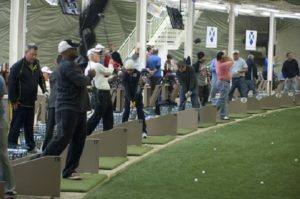 Numerous golfers got to try various prototypes and give their input in front of the camera’s, some folks might end up on TV during the show. Click here to hear the Wilson DVD 2 judges, Tim Clarke, Jeremy Roenick, and Rick Shiels. Clarke adds that some of the contestants who did not win the first time around, entered again, and one of them with a revised team who made the final six or so last time, is back in the running again. While it’s not known how many episodes their will be before a winner is named, Wilson is hoping to launch the club in November, so golfers can by it this time on Black Friday, in time for the holiday rush. That is if the USGA does not get in the way with a non-conforming issue, like in 2016 when the Triton won. I asked Roenick in front of Clarke if he will put the winning entry in his bag when the show is over, and he says he will. Roenick says he played a lot of his golf with the Triton in his bag over the last year. For more details visit Wilsongolf.com. THE GOG BLOG BY RORY SPEARS Director of Content. 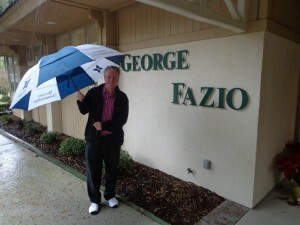 Follow Rory to Palmetto Dunes resort on Hilton Head Island, where the George Fazio Course is back up and looking good. Follow Rory on Twitter @GogBlogGuy. No rain this year. 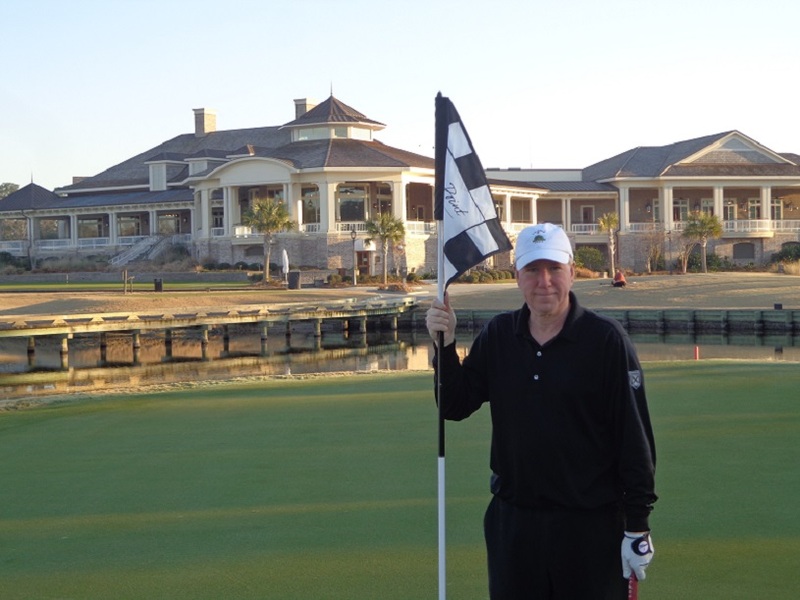 IT TOOK FOUR TRIES, but I finally made it out on the Fazio course at Palmetto Dunes resort on Hilton head Island. My first three attempts saw, course closed for an outing, a rain out and then closed for repairs from hurricane Mathew damage. But 2018 is a different story, I showed up and played this time in under three hours, and the course was all the fun a golfer can hope for and then some. While many of the courses in the low country of South Carolina, that are part of the resorts or in between the housing developments, can have tight fairways or a lot of water, the Fazio course does not. While there are a few holes with water, it’s not everywhere. When hurricane Mathew blew through in 2016, it hit the course pretty hard. It caused the loss of over 400 trees and it destroyed the bunkers. Credit Palmetto Dunes Resort for taking out the damaged trees and opening up the course. The Fazio course was closed for over five months while repairs and upgrades were done. The first hole on the Fazio Course, plenty of room for your opening drive. 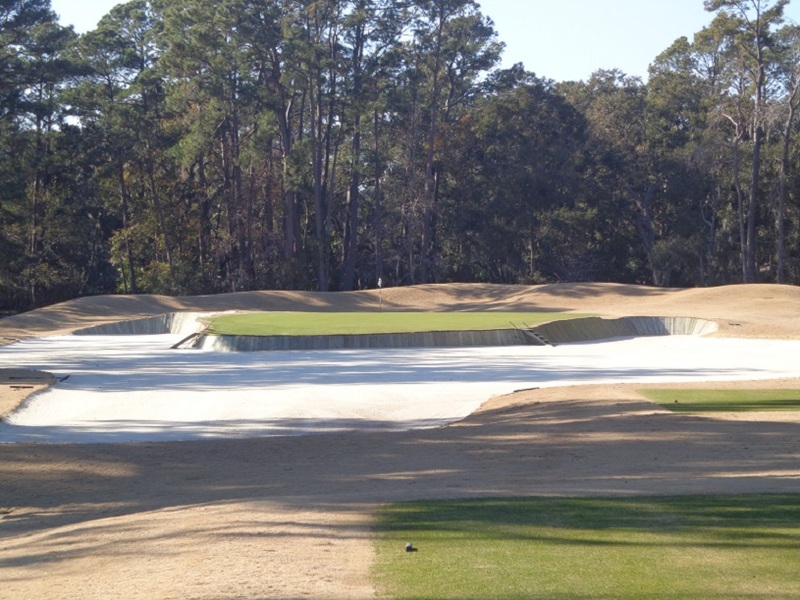 Palmetto Dunes used that time to make improvements and mostly to redo all the bunkers on the course, and it shows. The greens were redone and the quality of turf around the property is much improved. As a result, while the course is in great shape, it’s a straight forward right in front of you golf course with plenty of room to hit some golf shots. While hitting the fairways might not be real hard, the challenge here is to hit the greens on your approach shots. 17 of the 18 greens are elevated, so don’t be afraid to hit a little more club coming in. The greens are in great shape and roll very well. The Par 3, 4th hole (L) and (R) the Par 3 17th hole on the George Fazio Course. 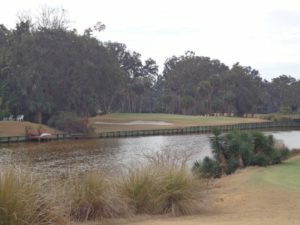 The Palmetto Dunes resort has three courses, the Jones, the Hills and the Fazio. While the courses of Robert Trent Jones and Arthur Hills seem to get most of the attention, don’t let the Fazio slip past you. This redone course is one will you enjoy. Go Play. For more information see PalmettoDunes.com. THE GOG BLOG by RORY SPEARS, Director of Content. 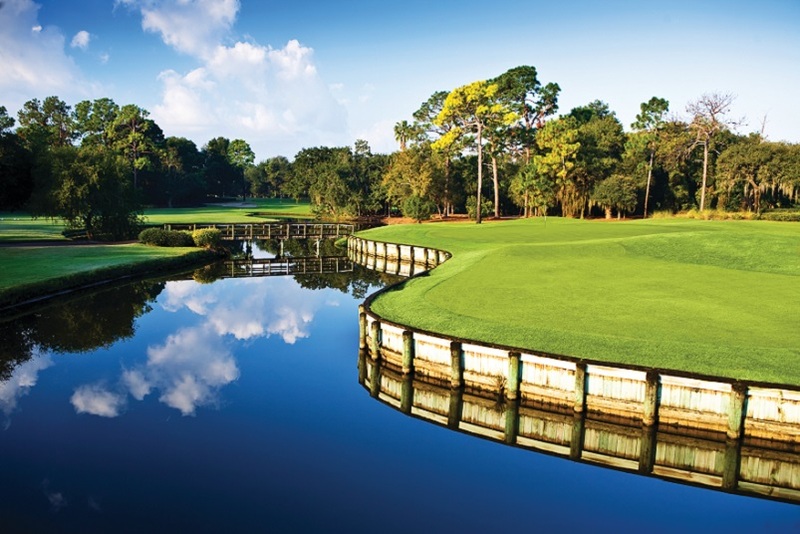 Follow Rory to Hilton Head Island and the Sea Pines Resort. On Twitter @GogBlogGuy Linkedin and Facebook. 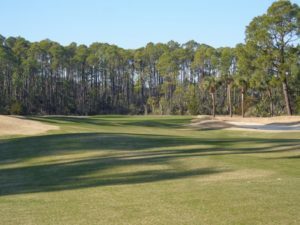 THERE ARE many different golf properties on Hilton Head Island in South Carolina. 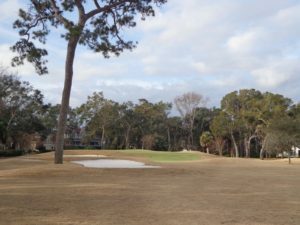 The Sea Pines resort is one of the more known ones, as every year after the Masters, the PGA Tour comes to town to play that course with the lighthouse on the 18th hole. Harbor Town gets the demand, and it’s a very well kept Pete Dye design. But Sea Pines is not all about one golf course, the resort has three courses that guests and members can play. More recently Davis Love III did a renovation on the course now known as Atlantic Dunes. The course has some nice holes on the ocean, and others that catch the eye of most golfers. As a result, the third course on the property Heron Point flies a little under the radar. It doesn’t need to. The other Pete Dye design has plenty of good holes, and doesn’t beat the amateur golfer over the head. 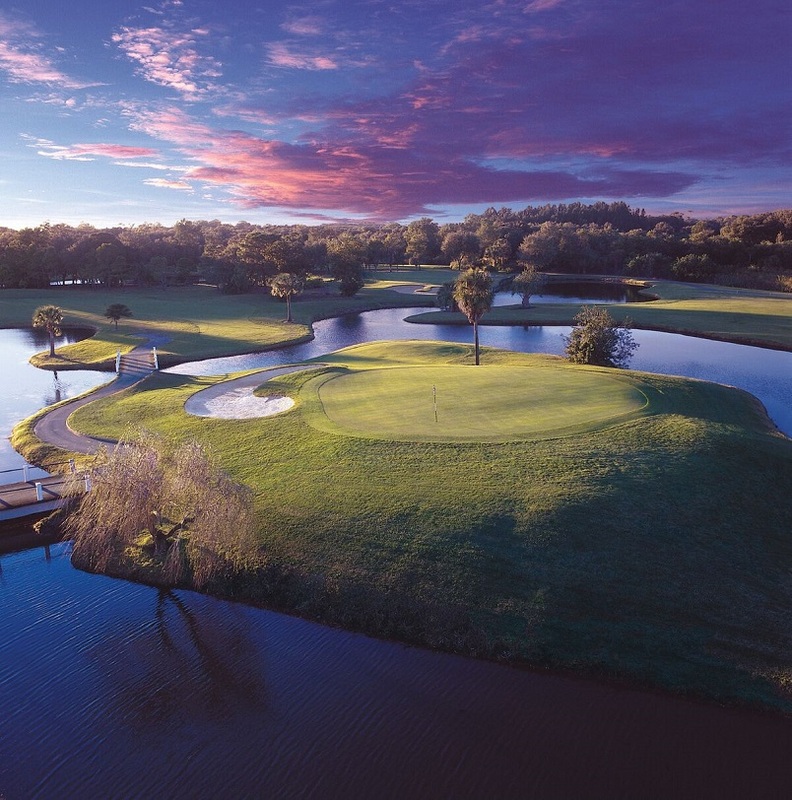 THE HERON POINT front nine wraps up with solid tests on the Par 3, 7th hole, and the Par 5, 9th hole with a back drop that encircles the green from behind the wetlands. 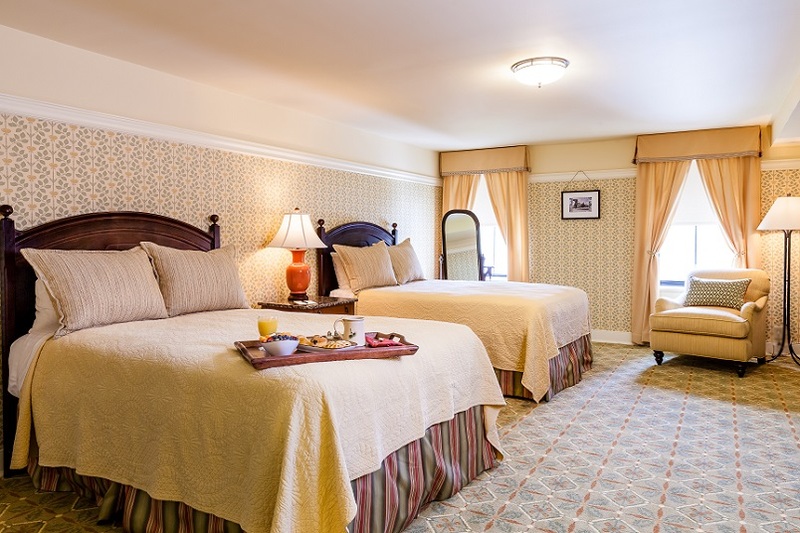 Heron Point fits the Sea Pines Resort in a perfect way, it carries the low country look and fits with the island land. Between the trees, some homes, wetlands and more. Dye’s design brings a little “Pete” and mixes in with what the property gave him. Yes of course there some railroad ties to be found, and some long running sand bunkers. Water on the course is strategically placed and not always visible off the tee. Dye takes the style of his famed island green at TPC Sawgrass surrounded by water, and does almost same thing on the par 3, 7th hole, with a green surrounded by sand. If you miss at least your dry, and there is no penalty stroke on the card for being in the sand. The par 5’s are not long (like the par 3’s) when played all the way back, but Dye creates three-shot par 5’s with doglegs coming at places where you don’t need driver off the tee. The second shot is normally going to have to be longer than the tee shot, to get home in two. On par 4’s it’s not uncommon to see the fairway shrink in width the closer to the green you get. If you want a big test, there are two par 3’s that go about 240 all the way back and a par 5, that plays 617. Heron Point is fun, Dye style challenging, with fairways that have plenty of non-flat l spots in the fairway. Subtle breaks on the greens, but playable in true Sea Pines style. The third course at Sea Pines, might be a second or a first course at many other resorts. Don’t overlook this Dye-design that’s hidden in between the trees, with hanging moss in the low country. For more information Seapines.com. THE GOG BLOG by RORY SPEARS, Director of Content. 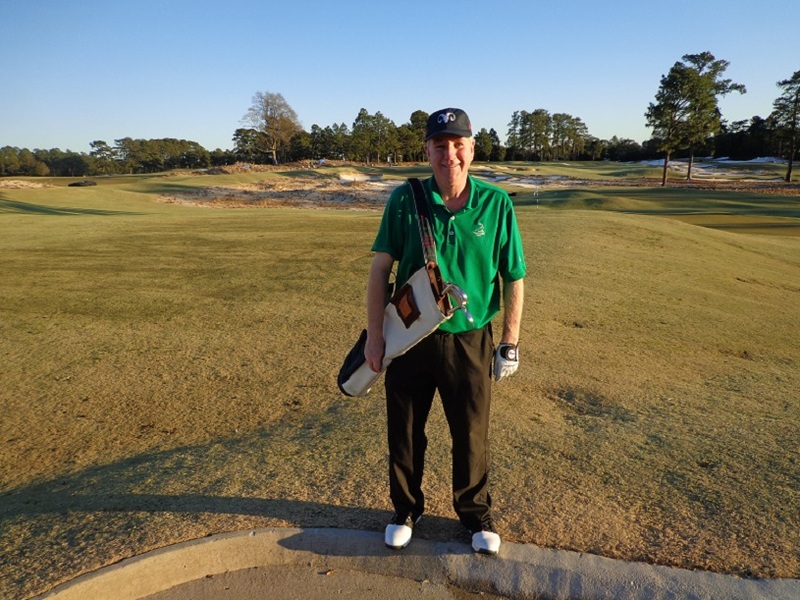 Follow Rory to Pinehurst and on Twitter @GogBlogGuy on Linkedin and Facebook. 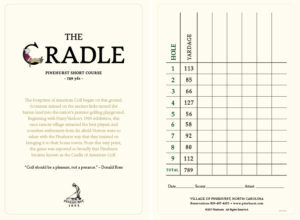 On the Cradle, Par 3 golf by Gil Hanse. OPENING DAY FOR GOLF SEASON, is always exciting. But I think it might be the first time I have ever played Round #1 on a Par 3 course. The new Pinehurst Resort Par 3 course created by Gil Hanse is a winner. It’s just 789 yards of pure fun, and the early results are turning into just what the resort wanted, and what the game of golf needs. After being closed for 3 1/2 days, great work by the Pinehurst grounds crew and some help from Mother Nature got most of the snow off the Cradle and allowed it to open yesterday afternoon. Within minutes golfers were out playing, and several of them were junior golfers with their parents. In some cases the golf bags were almost as big as the kids carrying them. The Cradle has been an instant success, and golfers, about 40 of them according to resort staff already have made hole-in-ones, including and 8 year old girl being one of the first. She is receiving a Cradle Pin Flag autographed by Gil Hanse for her shot heard through-out the Sandhills. One regret I have from my first round at the Cradle is that it did not include a par in spite of hitting 5 greens in regulation. Hitting borrowed wedges off of mats and a borrowed putter into some tricky pin placements, didn’t leave me many good looks. But at this point it was just nice to play, after looking at Pinehurst under snow, for 3 straight days. It was neat to watch the kids play, and several of them were proudly enjoying a course that they felt was their course, and to a point it is. I credit Pinehurst for creating a course that costs only $50 dollars to play. Better yet, you can play it all day long for your $50, free replays (grow the game). The demand to play this short course has created the need for six-some’s at times, but that has not hurt pace of play. Most of the time golfers still play in just over an hour. My clubs were in the trunk, but starter Jack Bickart the resorts former Ex-VP of Sales (recently retired) was in the starter shack, and got me a Cradle carry bag, and had me pick a couple of Vokey wedges out of the wedge bag and a Scotty Cameron out of the putter bag and off I went. Most adult golfers will only need 3-4 clubs to play. I played in 65 minutes and had a great time. There was some white stuff on the course in places, no not the new white tour sand making it’s way into courses, but real snow, the wet stuff that makes for good snowballs. But they don’t travel as far as a Pro-V1. After golf, I enjoyed my first meal at the new Deuce restaurant in the main clubhouse behind the 18th green of Pinehurst #2. That is also a winner. I’ll have more on Pinehurst in the days ahead, where there is so much going on. 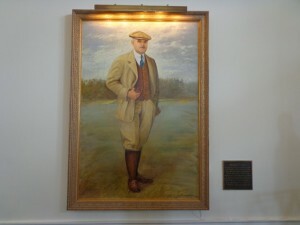 You can also visit Pinehurst.com for more details. THE GOG BLOG by RORY SPEARS, Director of Content. 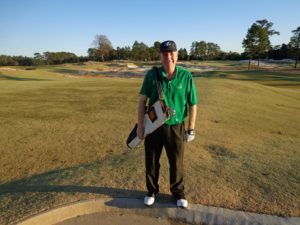 Follow Rory to Pinehurst and on Twitter @GogBlogGuy, and on Facebook, or Linkedin. Sitting in the rocking chair of the great Donald Ross. It’s finally done. Something you wondered why it did not happen years ago. 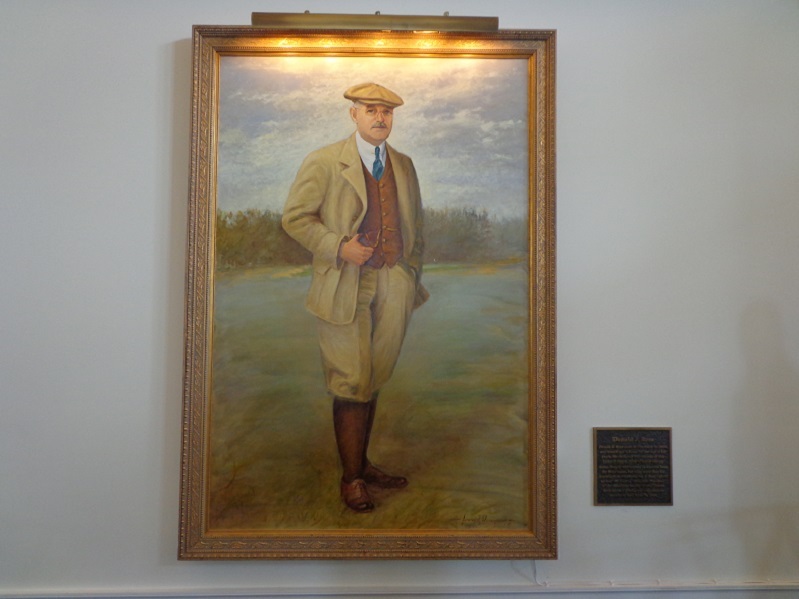 The Pinehurst Resort has finally purchased the home of the famed architect Donald Ross, that sits alongside the third hole of the famed Pinehurst No.2 golf course. Resort officials confirmed the previous owner moved out at the December, and the resort has begun making some needed improvements to the home, that will take 1-2 months to complete. 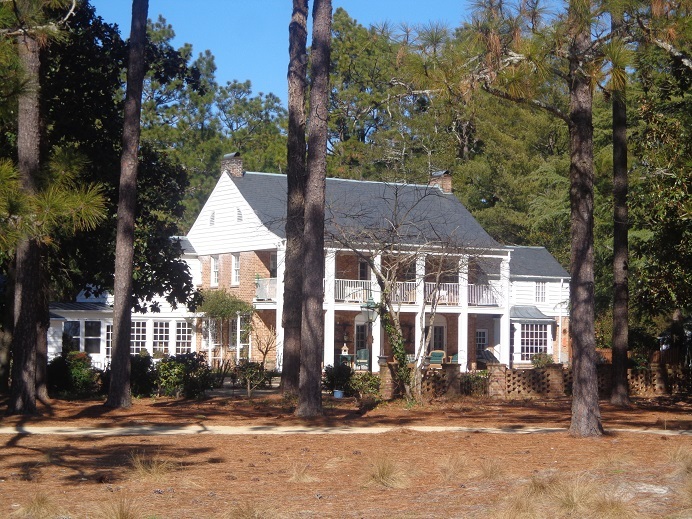 The Donald Ross house alongside of Pinehurst Course #2. 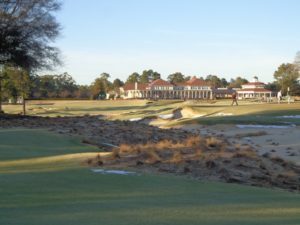 Currently noted architect Gil Hanse is working on Pinehurst #4, doing a restoration. 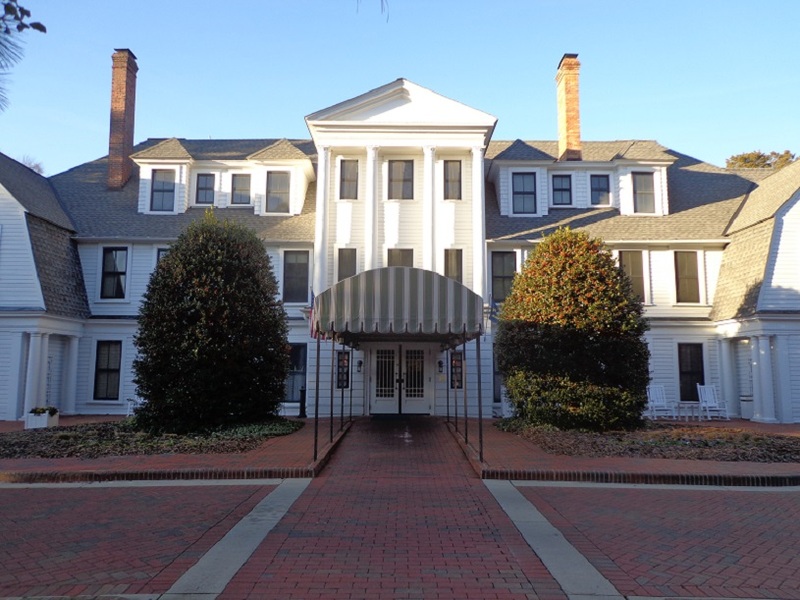 When Hanse returns from an out of the country project, he will be the first person to move into the house under the Pinehurst Resort ownership. It’s expected that Hanse will stay there until he completes his work on the course #4 restoration. Course #4 is expected to reopen at some point this fall, likely between Mid-September and October 1st. 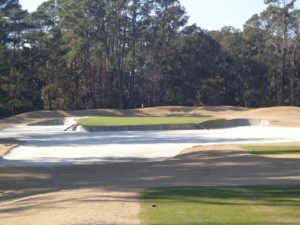 Follow Pinehurst.com and or this website for the announcement of the grand opening date. Pinehurst is working on guidelines as to what special events might take place at the Ross home, or who will be allowed to stay in the house when it’s ready to welcome overnight stays. The new Pinehurst sales and or marketing brochure talks about the Ross Cottage experience. One can only assume that this piece of golf history, will bring many of Pinehurst’s members and resort guests, special memories and experiences in the years ahead. 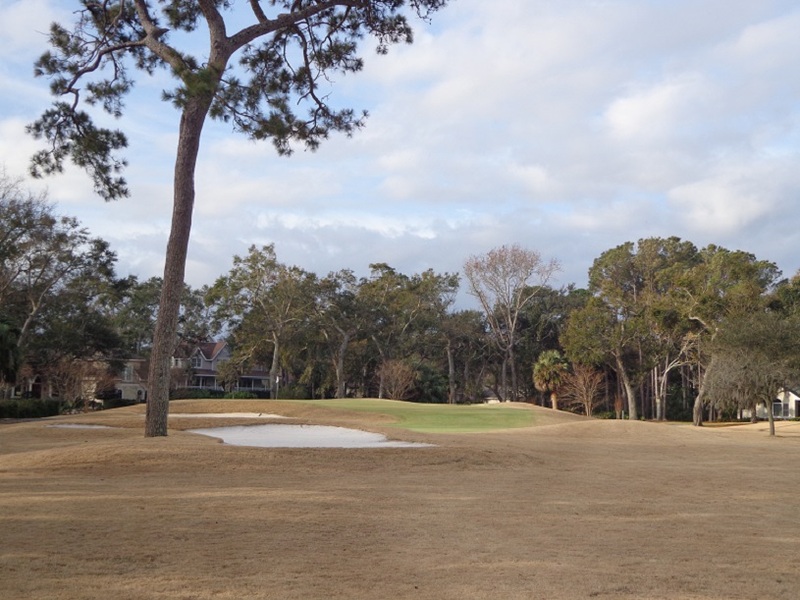 The Pinehurst Resort master plan continues to evolve in addition to the Ross Cottage and work on course #4. The Cradle like the rest of Pinehurst is full of snow. 4-5 inches of snow, the melt off is on, and this weekend and next week should be fine for golf here at he home of American Golf. Today, not so much, as most of the Village and the surrounding communities are closed for a snow day. You see, snow and Pinehurst don’t go well together. Even the main clubhouse is closed. Hopefully tomorrow is better day. Snow snow go away, golfers wish to play today. Putter Boy and the Payne Stewart Statue statue look like well crafted snowmen. The big news here today is the sale of Forest Creek, a development with two courses. For the first time ever, designer Tom Fazio has bought in as a partner, to buy up some of his own courses. His group now owns the 112 unsold housing lots, and over the next two years put over 2 million into improving the two golf courses. Story by the Pinehurst Pilot. The French Lick Resort was only 85 degrees cooler yesterday. than it was when this picture was taken. In fact it is almost never 5 degrees in French Lick, but it happens. Of course it had to happen when I arrived to start the 2018 winter golf trip. It’s always interesting to see a golf property when it’s not golf season. Their is a quieter buzz here this time of year, but still some noise in the casino. it’s always great to be here, but I’m looking forward to coming back in golf season. 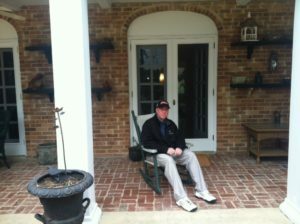 Day 2, is the trip to Pinehurst from French Lick, there is snow flakes in the air on the way. Some of them might land on the ground in Pinehurst. This is not a good thing. However with 50’s on the table for Friday, I know I will golf in Pinehurst no later than then. Opening day in Pinehurst, The Home of American Golf is a good thing. 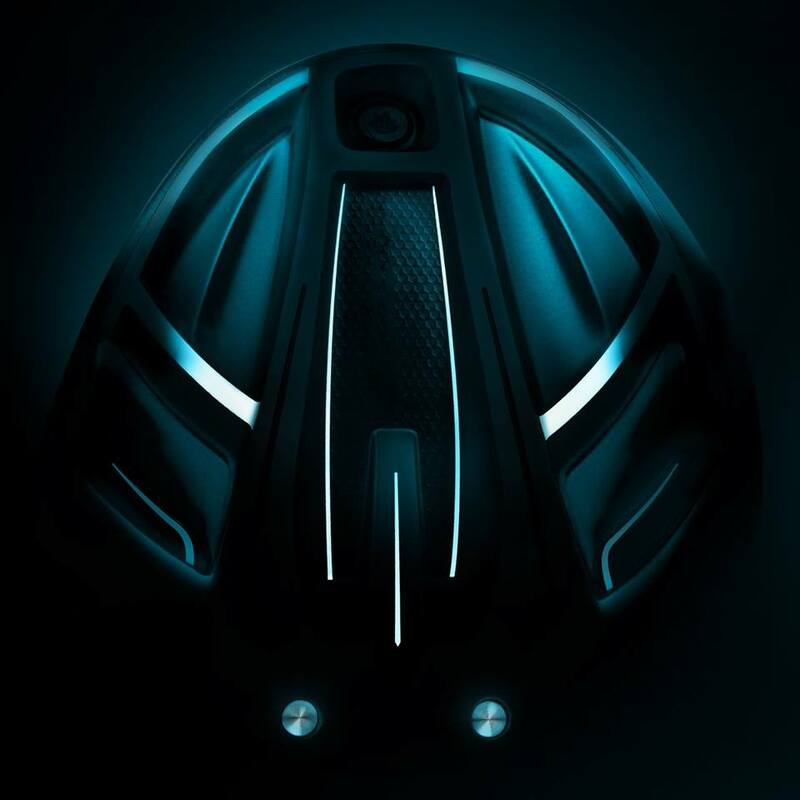 ANOTHER GOOD THING is the release of the Callaway Rogue Driver, pictures are out and you can order one later this week. 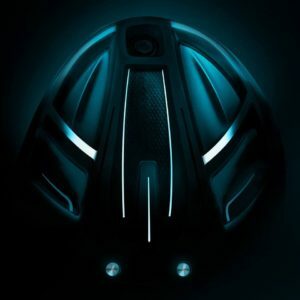 If the Rogue is as good or better than the Epic, Callaway Golf will have another winner. CALLAWAY NEWS from Mistwood, Director of Golf Andy Mickelson has switched to Callaway, making his announcement yesterday on Social media. Congrats Andy and congrats to the Mistwood golf Shop that should have a new Callaway.